Tom Corson-Knowles studied Entrepreneurship at Indiana University Kelley School of Business and graduated in May 2009 with honors. Tom has been eating Juice Plus+ products since 2000 and has been a Juice Plus+ distributor since May, 2006. If you knew what Tom knows about Juice Plus+ and nutrition, you and your family would not spend one day without eating your Juice Plus+. Although Tom has not received a degree in nutrition or medicine, he has met with literally thousands of health professionals, including doctors, nurses, chiropractors, acupuncturists, craniosacral workers, naturopathic doctors, nutritionists, dieticians, and many other health professionals. Tom has learned through countless hours of reading research, listening to lectures from health professionals, and through his large network of experts some of the most important things you need to know to live a life of wellness, full of energy, love and joy. He is most proud of the lives he has touched by improving his customers’ health and helping develop leaders in business and in his community. Tom loves to inspire others to serve more, make a bigger impact in the world, and spend more time with their families and making a difference in their communities. He volunteered more than 300 hours of community service in his career at Indiana University and has been to the Gulf Coast 7 times with Y’ALL (Youth Advocating Leadership and Learning) to rebuild houses for hurricane victims. Tom plans to create a foundation with at least a $1,000,000,000 (one billion dollar) endowment by January 1, 2019 to focus on research, education, and programs to protect the environment by reducing green house gas emissions, preserving native ecosystems, and other initiatives to preserve and prosper the Earth’s biodiversity. Visit Tom’s Nutrition Blog here. I am a big fan of Tom Corson-Knowles. He touched my life by sharing Juice Plus product. I am infinitely grateful I met Tom! Great blog! I really enjoy reading your awesome posts about nutrition and health. Enjoy the article but I don`t see where to receive to your newsletter. Hi Delora, I’m glad you liked the article and our nutrition blog. 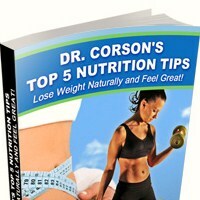 You can sign up for our newsletter and get Dr. Corsons’ Top 5 Nutrition Tips report for free here. I was drawn to your site after seeing your attractive face on a facebook ad. Your virility notwithstanding, however, don’t you think titling yourself “Dr.” without holding a medical degree is rather misleading, not to mention a probable breach of American, Canadian, and UK law as you’re dispensing health advice? “Using the AMA’s member search I’ve found a non-member physician, Dr. Candace Naomi Corson, whose name and State of practise roughly match the data I found on the “Dr. Corson’s Top 5 Nutrition Tips” report. Additionally, I’ve located on Ovid a two-page article titled, “Nutrition as protection for the busy person” written by Candace Corson and Debbe Buckman for “Beginnings: the official newsletter of the American holistic nurses’ association”, which is a trade publication of the American Holistic Nurses’ Association. The article is on Omega-3 fatty acids, attitudes towards health, fruit intake, etc. I concede that your mother is likely a doctor with the reservation that I made the assumption that the Dr. Corson listed on your report is your mother. This does not mean that I endorse any products or statements you or any parties associated with you make or may make. As purely a suggestion on my part, you might want to make it clearer that your parents assist you in formulating data. It would ensure clarity, transparency, and that you’d save people like me a lot of time. For some reason, I can’t get back to the site where I posted my original comment. If you link me there, I can post this as a follow-up to my other comment.